Speculative 18th century map of Africa. L'Afrique dressee, sur les relations les plus recentes, et assujettie aux observations astronomiques. 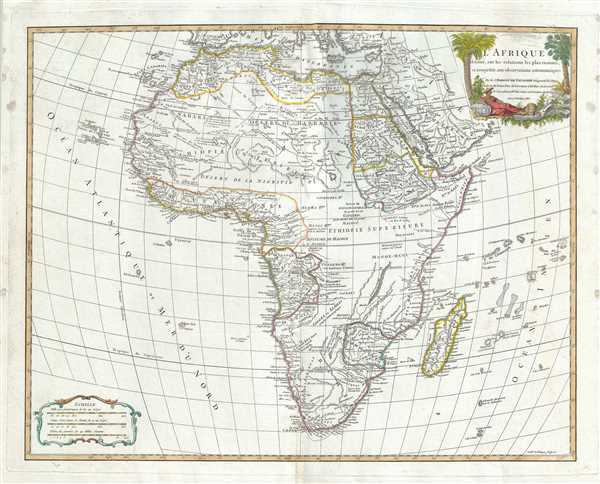 This is an exceptional 1783 map of Africa by Robert de Vaugondy. Following on the work of Nicolas Sanson, Vaugondy's map of Africa covers the entire continent in considerable detail. The late 18th century saw little in the way of African Exploration, so other than some minor updates to South Africa, this issue, remains consistent with the map originally published by Robert de Vaugondy in 1749. Like most maps of Africa from this period, the whole is rife with speculation. Vaugondy, unlike many of his contemporaries, attempts to limit his geographical analysis of the continent to those areas reported on in relatively recent times. Thus the White Nile, rather than turn east to meet with the Niger or flow south into the Ptolemaic Mountains of the Moon, merely tapers off into the unknown. Central Africa is largely left blank, although appears to be divided into several little known kingdoms: Monoe-mugi, Mujac, Gingir-Bomba, and Macoco, among others. The Sultanate of Zanzibar is given control of much of Eastern Africa from the Horn to the Zambesee River. Lake Malawi appears in recognizable but embryonic form with it supper terminus left unmapped and thus unknown. In West Africa the known kingdoms of Benin and Congo are mapped according to the early 18th century conventions. South Africa exhibits updated information associated with mid-18th century discoveries. A highly decorative title cartouche appears in the top right quadrant. Drawn by Robert de Vaugondy and published in his Atlas Universal. The Atlas Universal was one of the first atlases based upon actual surveys. Therefore, this map is highly accurate (for the period) and has most contemporary town names correct, though historic names are, in many cases, incorrect or omitted. Very good. Minor wear along original centerfold. Original platemark visible. Some spotting and offsetting with water stains near borders. Faded text in northwest Africa. Rumsey 3353.096. Pedley, Mary Sponberg Belle et Utile: The Work of the Robert de Vaugondy Family of Mapmakers, 426.